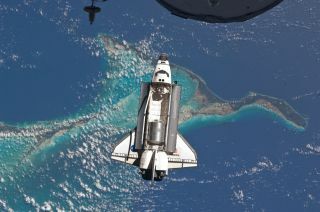 The space shuttle Atlantis is seen over the Bahamas prior to a perfect docking with the International Space Station at 11:07 a.m. (EDT) on July 10, 2011 on Flight Day 3 of NASA's last shuttle flight. Part of a Russian Progress spacecraft which is docked to the station is in the foreground. Atlantis was the fourth shuttle constructed and the last one to fly into space. It performed well in 25 years of service, flying 33 missions that included secret missions for the U.S. military, ferrying astronauts to and from space stations and launching several probes. The shuttle gained a reputation of being the unsung workhorse of the shuttle fleet because it sent so many satellites into space. It also has the distinction of flying the final shuttle mission before the fleet was retired in 2011. Atlantis was named after a ship that did work for Massachusetts' Woods Hole Oceanographic Institute between 1930 and 1966. The sailing ship was the first to image the ocean floor using electronic sounding devices. Notable: Famous for the large number of satellites it launched. Its first flight was a secret military mission. It also flew the last flight of the shuttle program, STS-135. Construction work started on shuttle Atlantis on March 3, 1980, in Palmdale, Calif. Using what it had learned from its other shuttles, NASA built Atlantis in less time than its siblings. It was also lighter than the other shuttles. NASA used thermal protection covers on the top of the shuttle rather than individual tiles, which saved substantial time and money during its construction. Atlantis ended up almost 3.5 tons lighter than Columbia, weighing in at 151,315 pounds. It took about six months to get ready for its first mission, which lifted off Oct. 3, 1985. To this day, Atlantis' first flight is shrouded in secrecy. Mission STS-51J took five people into space and lasted four days. At the time, NASA did periodic flights for the Department of Defense, sending classified payloads into space. Just over one month later, Atlantis headed for space again on Nov. 26, 1985, on mission STS-61B. It lofted three communications satellites into orbit. Additionally, Atlantis' crew members did two experimental spacewalks devoted to learning about assembling structures in space. The Challenger explosion in January 1986 grounded the remaining shuttle fleet for two years. It wasn't until December 1988 that Atlantis flew again, this time bringing another classified payload into space on STS-27. Atlantis' fourth flight, STS-30, marked a historic first for NASA. On board the shuttle was Magellan, a spacecraft that would be launched toward Venus. This was the first time that NASA launched an interplanetary probe from the shuttle's payload bay. The astronauts sent the satellite on its way remarkably quickly, only six hours after launch. Magellan fired its rocket stages successfully to coast to Venus. Its radar peered beneath Venus' thick clouds and eventually mapped 98 percent of the hot planet's surface. STS-30 marked the beginning of a flurry of satellite and classified payload launches for the orbiter. Atlantis repeated its interplanetary feat on STS-34, when it sent the Galileo probe toward Jupiter. It then flew two classified missions for the Department of Defense before sending yet another probe into space on STS-37, in 1991: the Compton Gamma-Ray Observatory. Astronauts had to do an emergency spacewalk to fix a high-gain antenna that refused to deploy. Once that was fixed, the observatory successfully watched supernovas and neutron stars for nine years. Atlantis went on to deploy a Tracking and Data Relay Satellite on its next mission, STS-43. Next, it lofted a defense satellite on STS-44, and a European tethered gravity experimental satellite on STS-46. In the mid-1990s, Atlantis' focus changed again. NASA and Russia had brokered an agreement for American astronauts to stay aboard the Mir space station, which would give both sides experience in working together in space ahead of the planned International Space Station. Space shuttle Atlantis rolls out to Launch Pad 39A on Nov. 10, 2007 for its launch in December. NASA flew 11 missions to Mir, and Atlantis shouldered most of the work. The shuttle flew seven times in a row to the orbiting science platform, ferrying astronauts back and forth. STS-71 lifted off on June 27, 1995, to usher in several historic moments. The flight was the first shuttle mission to head to the Mir space station. When some of the crew swapped places to head back home, Atlantis also became the first shuttle to see its astronaut manifest change in space. Also, the mission marked the 100th human spaceflight launch from Kennedy Space Center. Atlantis and Mir, when hooked together, formed the largest spacecraft orbiting Earth, at the time. The space station and space shuttle together weighed about 225 tons, or almost half a million pounds. While on board, the joint U.S.-Russia crew brought equipment into the space station and did several biomedical experiments. The shuttle flew again to the station in November 1995 on mission STS-74. Among the astronauts on board was Chris Hadfield, the first and only Canadian to make it to the Mir space station. On STS-79, Atlantis brought home Shannon Lucid after she spent 188 days in space, a record for an American astronaut. Atlantis also returned American Jerry Linenger to Earth after he had a challenging stay aboard Mir, which included a fire aboard the station as well as the need to do ongoing repairs on the aging facility. The fire, NASA later wrote, "altered the whole nature of his mission" and prompted a safety investigation by the agency. Missions to Mir continued through 1998, but Atlantis was taken off the roster for about three years to do some upgrades. The orbiter had two upgrades done before 2005, which included improving the plumbing and electricity for extended stays in space, putting in an airlock for the International Space Station, and upgrading Atlantis to a "glass cockpit" that included more advanced electronics. Atlantis leapt into station work once again when it returned to flight on STS-101. NASA was now in a new phase of building the International Space Station. The orbiter blasted off for the station on May 19, 2000, and became the third mission to do work there. Astronauts transferred more than a ton of supplies and did spacewalks to work on two cranes outside of the station. In the next three years, Atlantis crews hooked up cables between the Zarya and Zvedza modules, installed the U.S. laboratory Destiny and attached the Quest airlock, among other milestones. In 2003, shuttle flights went on hiatus again after the Columbia shuttle broke up during re-entry. Atlantis flew again on STS-115, which had the most unique delay of the shuttle program. NASA took the shuttle to shelter at the Vehicle Assembly Building as Tropical Storm Ernesto approached, a process that took hours. When an updated weather forecast came in showing that Cape Canaveral was in no danger, NASA brought the shuttle back to the pad while it was still on the road to the VAB. This was the only time a shuttle reversed course like this. In its last few missions to the station, Atlantis continued hauling heavy equipment such as the Columbus science laboratory and some truss segments. It flew the very last shuttle mission, STS-35, touching down safely on July 21, 2011. On that mission, Atlantis brought the Raffaello multipurpose logistics module into space, as well as a bunch of spare parts.